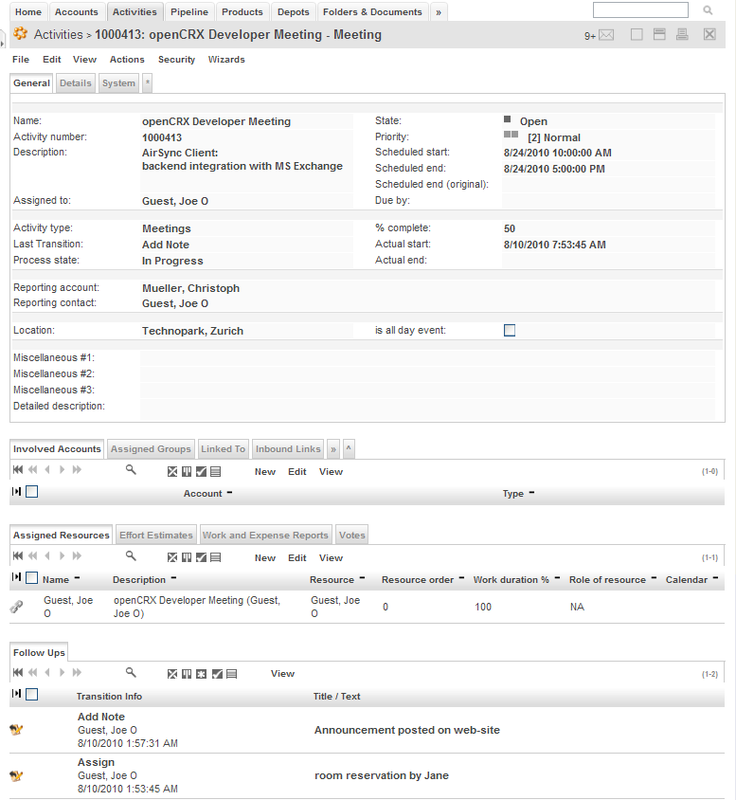 An activity can be thought of as any action for which an entry can be made in a calendar (and the advanced openCRX groupware features enable you to see all your activities in any calendar client compliant with ICS/iCalendar/CalDAV/ActiveSync, e.g. Thunderbird/Lightning, Sunbird, MS Outlook, iPhone, Android devices, Windows Mobile devices, etc.). 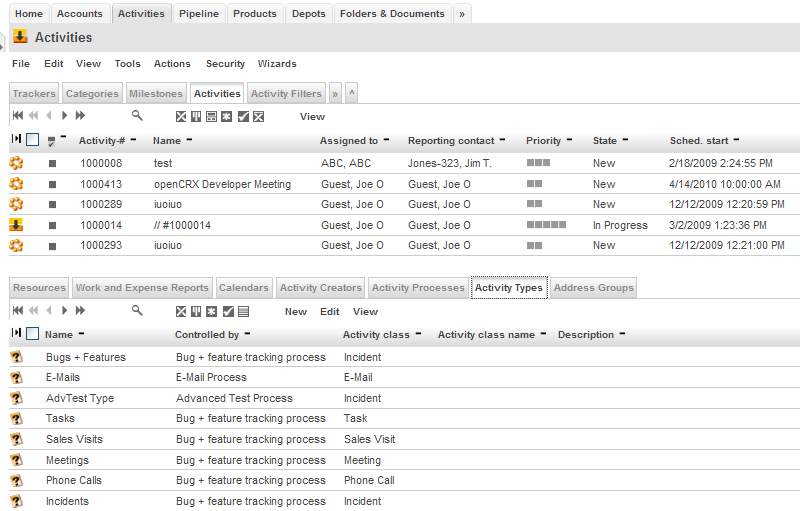 With openCRX you don't just keep track of your activities, you manage your activities! openCRX supports a wide range of activities, e.g. Meetings/Sales Visits, Tasks, Calls, E-Mails, SMS, MMS, Faxes, Mailings, and Cases/Incidents. You can group activities by Trackers, Categories, and Milestones. In addition, advanced filtering features enable you to group activities any way you like, e.g. all activities opened during the last 30 days, etc. Flexible assignment and routing of all activities, including service requests, results in improved service effectiveness as you drive coordinated action across teams and departments. openCRX users have instant access to complete and reliable customer records, detailed product information, and any information related to the sales process. This allows you to drive down service request resolution times. As openCRX is a real-time application every user is guaranteed to see up-to-date information. Activities are tasks a user performs when contacting customers, for example, sending letters or making telephone calls. Users can create activities for themselves to do, can assign them to someone else to complete, or can share them with others. An activity has time dimensions (start time, stop time, due date, etc.) that help identify when the action occoured or is to occur. Activities can also carry some basic properties that help identify what action the activity represents (title, description). Activities can be in a variety of states (e.g. pending, in progress, complete). The complete state of an activity can include several sub-states to further clarify the way the activity was completed. Activities involve one or more participants. For a meeting activity, the participants are those contacts or users attending the meeting. For a phone call or fax activity, the parties are the caller and a person or a group of people who is called. Similarly, e-mails can be sent to individuals or distribution lists.